There are two parts to Cool Ranch the way I see it. Both are pretty long and involved. Cool Ranch – Part I ends when you take on the Duck of Death and defeat him. That gets you closer to a missing map piece held by Captain Blood. But for now you’ll be sent back to Skull Island for a bit where you’ll work on getting to Port Regal. As an FYI, you still need to go through the Tumbleweed and Haunted Skyways in Cool Ranch. But you haven’t received a quest to do that yet. Don’t worry. You’ll get there. In Cool Ranch you spoke to Don Rafael who told you he had information. But he couldn’t give it to you until you completed a favor fwor him. To reunite his adopted son Don Rodrigo with Rafael’s daughter Carolina. You know her as Mustang Sally. It’s been a long time since you’ve seen Sally in Flotsam however. So you’ll need to head back to the Flotsam Skyway and talk to One-Eyed Jack. Jack will send you to Scrimshaw to find Rosco Ratso. When you find him however, he’ll deny knowing Sally at all. But thank goodness you took Ratbeard onto your crew way back when. Because he knows Rosco and will be able to get the information you need. You learn that Sally’s big boss is on a Monquistan Flagship. But remember, the Monquistans aren’t real happy with you right now. So be cautious as you approach the ship near the Scurvy Dog Hideout. Amazingly enough you won’t need to get into a battle to board the Monquistan vessel. And even better when you do dock with the ship, you’ll meet an old friend. It’s General Gortez! He will welcome you aboard ship and tell you what he knows about Sally. 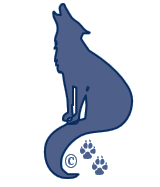 You’ll find more information at the Scurvy Dog Hideout. Head on over there and you’ll find some folk to help you out. First check in with Bosum Moon. He’ll tell you the person you want to talk to is Captain Dan. You’ll find him up in the Temple Hideout. 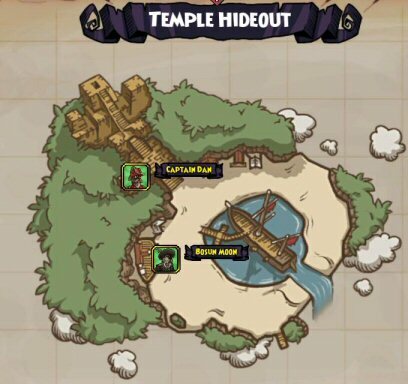 Stay close to the edges of the beach and you can avoid battles with the Scurvy Dogs running around the hideout. Go up the stairs and you’ll find Captain Dan in the first level of the temple. 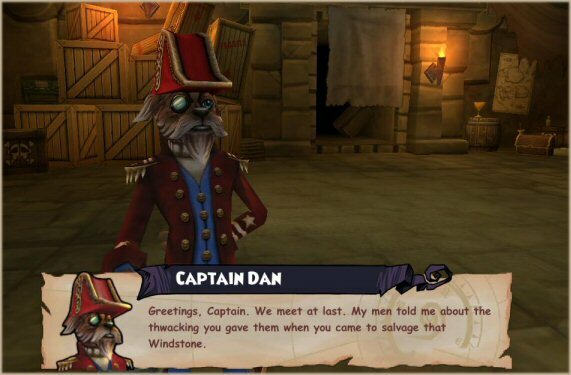 When you find Captain Dan he’ll let you know that he did indeed help Sally get to Port Regal. But he gave her the only travel papers he had that allowed her through the blockade. But maybe he can help you out for a favor. Of course. Seems he and his crew have been stuck here on the island for quite some time and they need supplies. So if you’ll go out in the skyway and pick up some fresh fish and fresh food, you’ll try to help you get to Port Regal as well. The problem with the fresh fruit, he wants you to go to Monquista to get it off the Del Monte ships. Be careful! But why you’re there, stop in La Mancha and visit your old friend Pancho Stanza. He could use a little of your special kind of help too. And since you’re already there, you might as well give him a hand. The battles are pretty straight forward, so do your duty and head back to Captain Dan. Three of our Captains reached level 30 after these quests. The kewl thing about that…you get another bottle of Mojo. That’s the blue potion bottles. You should have 2 at this point. When you’re promoted to Level 30, you’ll get another bottle for 3 total. 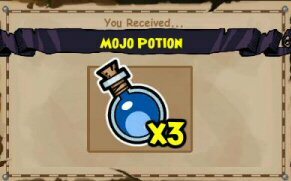 You’ll have to go back outside the temple and pick up some floating blue mojo yum. But there should plenty out there to fill up your new bottle. Additionally, these three Captains have also been sent off on different additional side quests through this process of getting to Port Regal. When you are sent to another area, make sure you check around the near by towns or around the town you’re sent to and see if anyone has an additional quest for you to pick up some extra companion training points. Or at the very least, additional gold. Who can’t use more treasure! Back in the main quest line: When you return with the supplies he’ll thank you and true to his word, he’ll try to help. 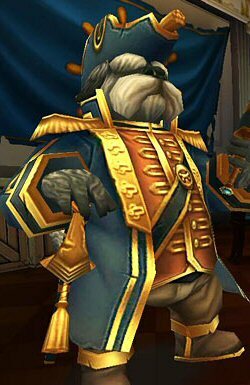 He tells you that “To pass the blockade into Port Regal, you’ll have to give the Royal Navy something it wants.” It seems a Monquistan named Count Brastillo de Brass has been rather troublesome for the Marleybone Navy. The Count is himself the best captain in the Monquistan Navy. He’s known as the Brass Monkey. To get through the blockade, you simply deliver the Brass Monkey to the Marleybone captains and they’ll surely let you through. Of course you have to find the Brass Monkey first. And to do that, Captain Dan will gladly tell you where he is, for another favor. This time, he needs you to clear out some of the troggies that have overrun the tunnels in the Temple Hideout. So go get to it. When you have completed the task of clearing out the tunnels, return to Captain Dan. He’ll hold to his bargain and tell you how to flush out Count de Brass. 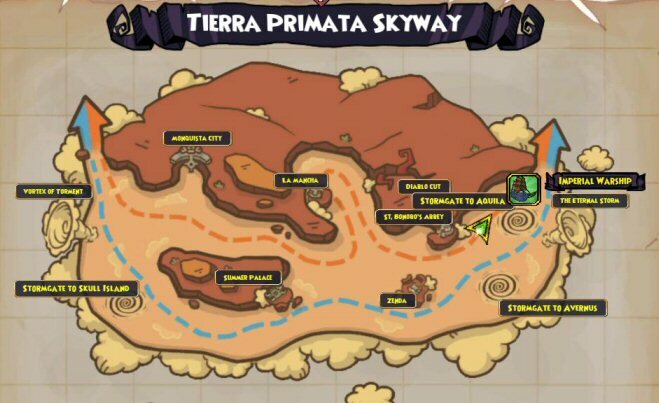 Start the long journey to the far side of Tierra Primata Skyway. You’ll find the Imperial Warships near the stormgate to Aquila and across from the Eternal Storm. Before you get into battle, dock at St. Bonobo’s Abbey to link up with the Life Fountain. If you select the ship nearest to the Abbey, you can avoid getting into battle with more than one ship. Simply stay between the abbey and the ship you’ve selected to fight and the other warships should stay on the farside of your battle. Once you’ve defeated the Imperial ships, return to Captain Dan. He’ll congratulate you and share a letter he has received from Count Brass. “To the insolent captain of the cowardly fleet of Marleybone. Your arrogance can no longer be borne. I, Brastillo de Brass, greatest captain…blah blah blah..” Head on over to the Antilles Maelstrom and meet him face to face. 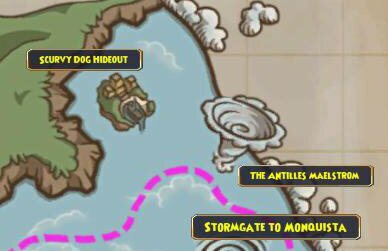 You’ll find the storm right off the docks from The Scurvy Dog docks. When you sail into the Maelstrom, you won’t get a lot of chance to take on the Brass Monkey ship to ship. His ship is unsinkable anyway. This is a hand to hand combat. He and his crew will be protected by barriers that are easily demolished. Focus on his crew, one at a time and then you and your crew can focus on their Captain. When you have defeated this “brash” Monkey, you’ll be sent to take him over to the Inspector. He’ll be in a Lighthouse near the entry into Port Regal. 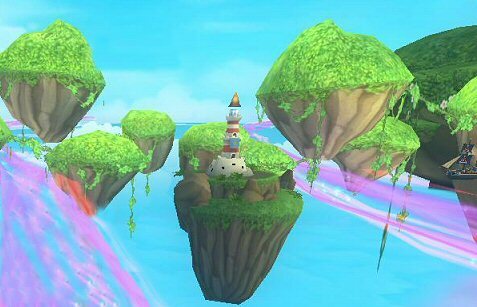 Port Regal isn’t really a new world as much as it’s another skyway within Skull Island. You’ll simply sail over there. This entry was posted on October 26, 2013, in Game Guides and tagged arroyo grande, big sky, cool ranch, cooper's roost, coopers ranch, crystal cave, dixie chicks, game guides, game hints, games, hidden valley ranch, Junction, Kid friendly, kid safe, locations, online, Pirate101, Pirates, quests, role play, Skull Island, Skyways, spells, Spiral, Stormgates, tumbleweed, Windlanes, Worlds. Bookmark the permalink.